When we arrived at Asheville’s Carolina Bed & Breakfast at 5:30 p.m., a chorus of “welcomes” jolted us. The porch was filled with guests swinging and sipping. We walked in the front door, and flew to the display of hor d’oeuvres in the living room on the right. The large coffee table was covered in bruschetta, nuts, fried avocado, shrimp cocktail, etc. And wine sat by the window. It was the right way to be overwhelmed. For a second we thought the warm welcome was just for us. The good and bad news is that it wasn’t—because they host an evening “social hour” every night with wine from the nearby Biltmore Estate and snacks from the kitchen. You could say, ‘tis the style of a bed-and-breakfast, and I would agree. But in all the bed and breakfasts I stayed in, the atmosphere was warm, but never this toasty. The Carolina Bed & Breakfast, part of the Asheville Bed & Breakfast Association, sits on a street in Asheville’s historic Montford district. The block is lined with big old homes that are of similar style but each with their own distinctions. The B&B, for example, is painted a warm yellow with forest green beaming and framing. It was built in 1901 by Richard Sharp Smith, the Biltmore Estate’s supervising architect. 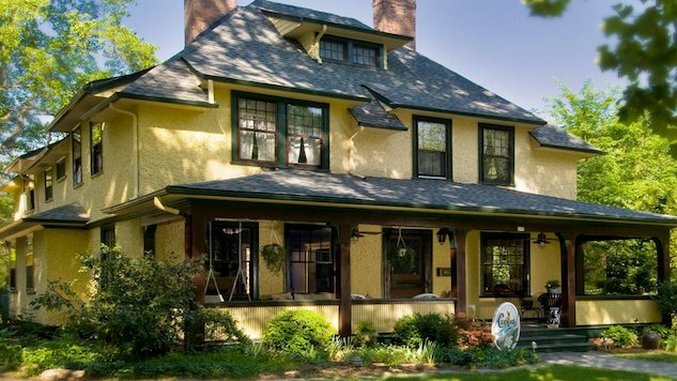 The Carolina Bed & Breakfast, an Arts and Crafts Style house, is an example of Smith’s preference for pebble-dash, shingles, high-pitched roofs and heavy stone foundations. As you walk up the stone path leading to the porch full of wicker furniture, a porch swing (of course) and a welcoming vibe, take a whiff of the bursting garden sitting just ahead of the house, serving as an intro to the experience ahead. At any time of year, the lawn could be lush with hydrangeas or daisies. As you walk in the house, you’ll be drawn to the heavily decorated living rooms on both sides of the foyer. Both are painted blue, which is in contrast to the brightness of the house’s exterior. But it works—the outside is a loud and friendly welcome, but once you step inside, you’re swathed in warmth and tranquility. The house is filled with furniture, antiques and artwork from around the world. Every piece has a story, from the owner’s great-grandmother’s clock that began its life in Raleigh, North Carolina and traveled around the world before returning to rest once again in North Carolina, to the intricate wood carving from the rafters of a Balinese house. Traditional family oil portraits grace the fireplaces while upstairs a large Vietnamese oil painting lights the staircase from above. In the hall past the living rooms, a chandelier lights it from below. Expect Oriental rugs under floral couches and wingback chairs, and shelves filled with glass statuettes. The dining room, where you’ll get to know you’re fellow travelers, sits off the living room to your right, with two long tables and about 12 chairs. Allow the relief to wash over you as you realize breakfasts won’t be awkwardly intimate. As with most bed and breakfasts, the bedrooms are anything but bland. There are seven to choose from, including a cottage. Unlike the Victorian homes of the same era, Arts and Craft Style houses put more emphasis on natural wood, clean lines and simplicity. This is echoed in the bedrooms. Each room is uniquely decorated with a color scheme and style of its own. Choose between yellow walls and antique dishes serving as décor in the Miss Webb Room, hand-stenciled floral wallpaper and Chinese ginger jar lamps in The Mockingbird Room, a framed section of the original wallpaper over a fireplace in The Hummingbird room, and so on. While the personalities were strong, none of the rooms will overwhelm. There are clear color schemes and each tchotchke is placed with a purpose. Every room has a private bath, bathrobes and air conditioning. Some have Jacuzzi tubs and fireplaces. For a bed-and-breakfast experience matching the ones you’ve seen in movies, we highly recommend arriving during Social Hour. From the wild welcome from strangers to the silky yet crunchy fried avocado, it’s an entrance we’ll never forget. And if you think the cheer is just due to the wine and free snacks, take a walk around the property during the day. While it’s quieter, there’s guaranteed to be something that will charm you, whether it’s hearing the owner singing along to Carrie Underwood while she goes about her business in the kitchen or the constant ticking of the grandfather clocks that reminds you of your grandmother’s house. The house itself is surrounded by once acre of gardens, with flowers, herbs and butterflies galore. For peace and quiet, you need not go far: just head for the pergola on the edge of the property. But for the hustle and bustle of the city, walk half a mile to feel worlds away.